Clint Heinze -- Jalen Jury and Dimitri Perera watch as Head Coach Tim Collins advises his players. 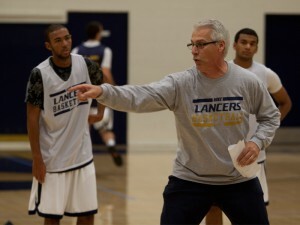 In California Baptist University’s first year of Pacific West Conference play, the athletic department has seen success in four different sports already this year, but Lancers men’s basketball is fighting to maintain the pace. Men’s hoops has struggled to uphold the measure of success set by other programs this year, with a record of 3 wins and 3 losses this season, 2-1 in the regular season. With losses to Division I opponents California State University Northridge (0-4 so far in the regular season) and University of California, Irvine (0-6 in the regular season) as well as a loss to Division II opponent California State University, Los Angeles, CBU basketball could be on the path to another unimpressive season. “I think we have a lot of potential, but we’re just trying to mesh,” Micah Sherman, sophomore guard said. “We’re just trying to put coach and the team on the same page with chemistry. I think we definitely have a lot of potential,” Sherman said.The Lancers finished 14-16 last season, which capped off their National Intercollegiate Athletic Association career as they moved into NCAA Division II competition the following year. The Lancers have had to make some adjustments this year because of the move to NCAA competition, which includes shorter practice times and less games in a season. As a member of the NAIA, the Lancers started conference games as early as Nov. 30, but this year won’t get into PacWest play until Dec. 17. The Lancers will play three fewer games this year because of NCAA Division II schedule limitations. The team has also had less time to prepare for the season. Head Coach Tim Collins told the Banner in an interview earlier this year that the team was challenged with having less time to prepare for the season. “Normally we’ve had six weeks [to practice] when we’re in NAIA…now we have the same that they have; 14 days and then we play a game,” Collins said. Shooting a less than impressive .510 percentage from the stripe, the Lancers are struggling with holding onto the ball as well as capitalizing on free throws. CBU has turned the ball over 46 times this season, while their opponents have only given up 32. “Every free throw can determine whether we win or lose a game…our last game came down to one point,” Sherman said. “It’s super important and definitely something we need to work on,” Sherman said. Turnovers have been a problem for the Lancers in the past. Last year’s team turned the ball over 519 times for the season, while only causing their opponents to give up 393. “Last years team had some key players that really turned over the ball a lot. Those guys aren’t here this year,” Collins said. But, there is a light at the end of the tunnel as the Lancers have deeper bench to work with the season, which should help the team as the season progresses. “We’re two deep in every spot and there’s quite a bit of equality across the roster. It’s going to have to be our strength,” Collins said. The Lancers start conference play on Dec. 17 against Academy of Art University.